Amendment process means a change in some of the existing provisions of a statute and a law is amended when it is hi whole or in part permitted to remain and something is added to, or taken from it, or it is in some way changed or altered in order to make it more complete, or perfect, or effective. 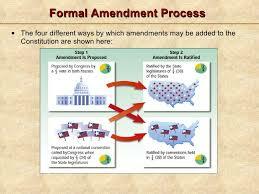 An amendment is not the same thing as a repeal, although it may operate as a repeal to a certain degree.amending clause to be a so fundamental to a constitution that he calls that clause the constitution itself. Framers of our constitution therefore thought it wise to incorporate Provision for amendment process of the constitution and they have done it with a view to overcome the difficulties which may encounter in future in the working of the constitution. No generation has monopoly of wisdom nor has it a right to place fetters on future generation to mould the machinery of government according to their requirements.